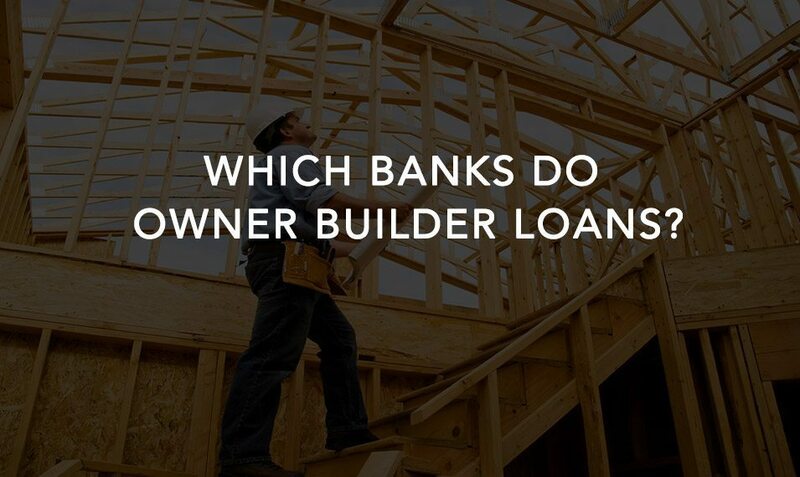 Which Banks Do Owner Builder Loans? Banks and financial institutions can sometimes make it difficult for owner builders when it comes to providing loans. Banks want to see if you can manage a budget along with long term construction projects at the same time. All in all, it is a risky investment for banks and they want to take all the possible measures to manage that risk. So, you have to ask the right question, i.e., how the chances of getting a loan approval can be increased? How to Increase your Chances of Getting Loan an Owner Builder Approval? Effectively Prepare a Budget – Banks and other financial institutions always look for the estimated cost of your project. Therefore, add a contingency buffer of around 10 – 15% whenever you prepare a budget. Moreover, a lender will not give more than 60% of the build cost if you are not a licensed builder. So, it is important to prepare a reasonable budget accordingly. Get a Pre-Approval – Before signing an owner builder agreement, you should get a pre-approval. This will provide a good estimate of the maximum loan to value (LVR) ratio and enable you to decide whether you should go for the loan or not. Patience – You must wait for the loan approval before starting construction, because it is highly likely that banks may not approve the loan if you have already started the construction. Consult a Financial Advisor – Whenever you apply for a loan, seek the advice of a financial advisor or accountant who can help you prepare a budget. They will also guide you as to how much you should borrow. Moreover, the maximum LVR you can get is 80%. However, there are only two lenders who offer it in Australia. The majority of the lenders usually allow between 50 – 70% LVR. Banks issue a commencement letter when the estimated cost is approved by the valuer. As the lender provides only a certain percentage of the entire cost, the owner builder has to manage the remaining amount. Therefore, if you invest funds first once the construction process starts, when the initial investment is exhausted, the loan can be used to complete the remaining project. Banks do not release the entire loan amount in case of an owner builder loan. Unlike a traditional home loan, this loan is provided to a borrower as the construction progresses. A valuer evaluates the work as each stage of construction is completed, and then authorises it. Once authorised, a bank releases the next progress payment for the second stage of a project. Ask Hunter Galloway how we can streamline and assist you with this process. There are a number of factors you should consider when applying for an owner builder loan. Some of them are discussed below. The key benefit of owner builder loan is saving money. Instead of passing the responsibility to a professional builder, the owner takes charge of the construction. This is one of the reasons why it is different to a standard home loan. Because the owner is in charge of the construction, lenders consider it a risky investment. There is a possibility that an owner may not be experienced in controlling and managing the budget. This is why banks only approve a certain percentage of the overall project so that a borrower does not exceed the required limit. Simply because it is an owner builder loan, does not mean it is impossible to obtain. Find a qualified and experienced broker and seek his assistance to find the right lender. Hunter Galloway can assist you with outlining which banks offer this type of loan. This information strengthens your loan application and makes it look more attractive to the lenders.